Join us to dive to one of the top diving destinations in the world and discover the best diving the Solomon Islands has to offer aboard MV Bilikiki, with Bilikiki Cruises. 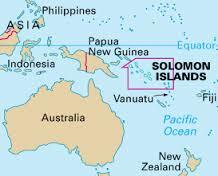 The Solomon Islands is located near the epicenter of marine diverstity, so it has an unbeliveable range of marinelife from macro subjects through to pelargics such as mantas, sharks and schooling jacks and barracuda. Combine that with ship and plane wrecks from WWII, caves/swim throughs and access to the more remote dive spots aboard the MV Bilikiki and you have a bucket list dive trip that should not be missed. 8 Deluxe Cabins have a double bed plus a single bed above, 2 cabins with twin beds and no bunk. All have private shower, toilet and hand basin. Price includes: Airport transfers in Honiara, onboard accommodation, meals and snacks, unlimited diving, weights and belt, tanks and air fills. Price does not include: Flights, USD $25.00 per person/ night tax, bar drinks, Nitrox and personal purchases. For more photos, videos and information about diving the Solomon Islands aboard the MV Bilikiki visit http://bilikiki.com. Download a FAQ fact sheet. This is a Rebreather Friendly trip - not planned as a technical diving expedition, however, we will be catering for recreational diving on rebreathers. If you are interested in deeper dives, wrecks and more technical diving, then contact us for an optional add on to this trip that we are putting together! Contact US now for more information or to book your place.